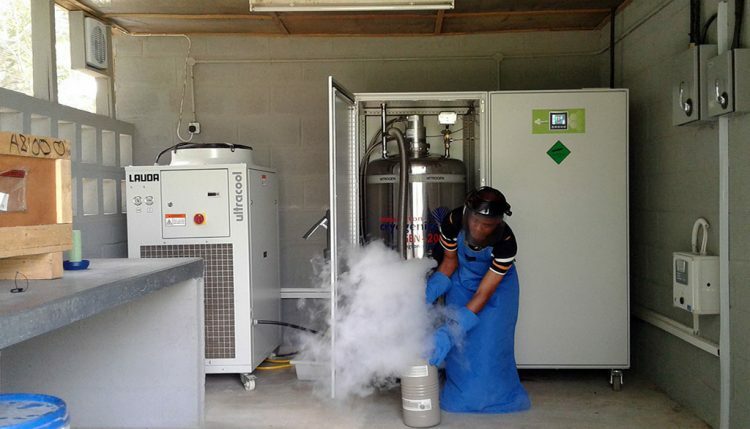 A new generating set that will guarantee a steady supply of liquid nitrogen for the long- term preservation of clonally propagated crops conserved at IITA’s Genetic Resource Center (GRC) was recently launched. 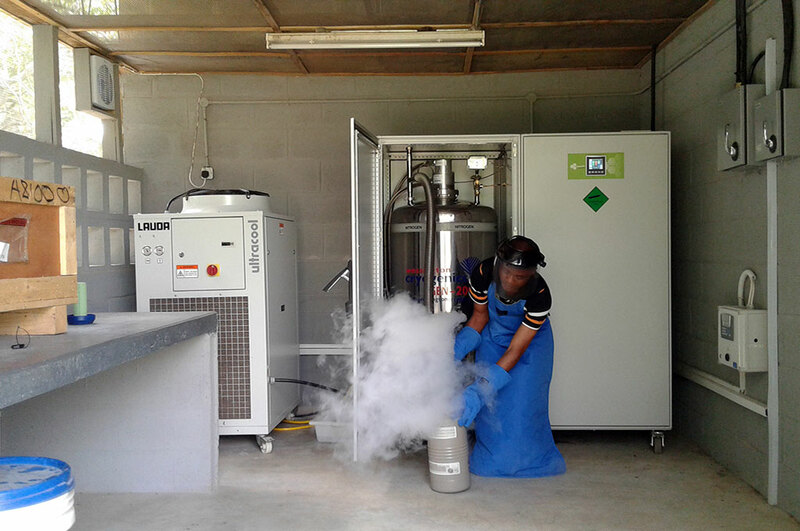 In line with implementing the global conservation strategy of clonal crops, the new liquid nitrogen generator (LNG) for cryobanking will ensure that the Institute continues to maintain world-class standards in the long-term preservation of genetic materials of crops of economic importance to sub-Saharan Africa. “The LNG is a vital piece of equipment for the cryobank,” said Badara Gueye, responsible for IITA’s in-vitro genebank and cryobank. “It will guarantee a continuous and reliable supply of liquid nitrogen for the cryopreservation of cassava and yam international collections”. The machine works by capturing the nitrogen in the air (around 70%) and concentrating it under high pressure to liquify it at -196°C. It has the capacity to produce 60 liters of liquid nitrogen daily. The liquid nitrogen is then stored in a 200-liter in-built tank, ready for dispatch. Other IITA units such as the Bioscience Center and Virology Unit can also make good use of the liquid nitrogen produced as well as research partners based in Ibadan whose work have been seriously hindered by insufficient, chaotic, and costly liquid nitrogen supply. The machine was commissioned by Ylva Hillbur, Deputy Director General Research for Development, on 2 June, with the support of Robert Asiedu, Director, IITA Western Africa Hub; Michael Abberton, Head of GRC and deputy director, IITA Western Africa Hub; Eric Danquah, Director of West Africa Centre for Crop Improvement, Ghana; and IITA colleagues.